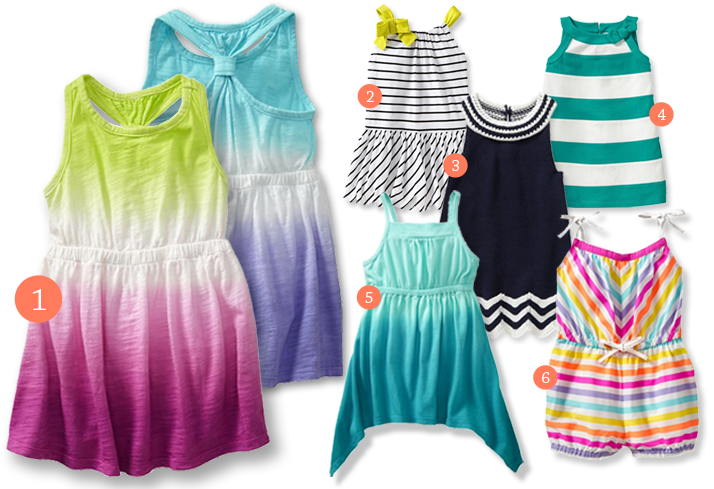 Boy oh boy, are super cute dresses – and a romper – out in full force at the Gap and Old Navy! How cute is the dip-dye tank dress? The knot on the back is such a fun detail. I had to restrain myself from ordering one in every color (I went with the teal). And, the best part about this type of dress is that, after a couple of growth spurts, it simply transitions into a tunic. Win win! Check out a few highlights below, and many more colors and styles online. Plus, both sites are running great promotions now (including the GAP’s “daily deals” offers that change each day). Have fun! 1. Dip-dye tank dress, 2. Bow-tie jersey dress. 3. Crochet zig zag dress. 4. Bow striped dress. 5. Ombré sharkbite-hem dress. 6. Rainbow striped romper. Previous Post Yeiks! Is your Smartphone Camera Geo-Tagging your Photos? Next Post Eureka! A Mess-free Bubble Blower.